The Westin, Sheraton and W hotels (part of Starwood Hotels & Resorts) introduced a "Love That Dog" program in 2002. The hotel chain commissioned a study to look at the habits of 400 dog owners and found that 76% said they would be more loyal to a hotel chain that accepted dogs, even when they weren't traveling with their pet. The study also revealed that a full 16% admitted to smuggling their dogs into hotels that did not allow pets. 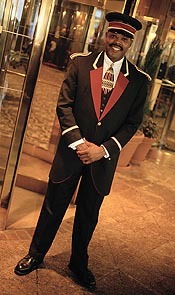 Loews Hotels introduced their "Loews Loves Pets" program in 2000 for VIPs (Very Important Pet). Each visiting VIP receives first-class comfort with gourmet room service, specialized bedding, a pet amenity, and guest services designed to make pets and their owners feel right at home at the chain�s 19 properties in the US and Canada. Finicky felines and hungry canines can choose from their own special room service menu that was designed to provide proper nutrition to help pets deal with travel stress including jet lag and altitude adjustments. The pet room service varies at each hotel and most include items such as roasted salmon and tuna delight for cats and bow wow burgers, chicken and rice and grilled filet for dogs. All menu items and preparations for the room service menu were developed and approved by a licensed veterinarian. Loews Hotels also offer a "Did You Forget Closet" that loans guest pet necessities such as dog and cat beds in different sizes, leashes and collars, and pet videos. Kitty litter boxes and litter, pooper-scoopers, and a selection of pet toys (such as rawhide bones, catnip, and scratch poles) are also available for purchase. Each Loews hotel has established special cleaning procedures for pet stays including the use of HEPA-filtered vacuums so that all traces of pet allergens are removed in preparation for the next guest. All Four Seasons hotels accept dogs and cats as long as they are under 15 pounds (larger pets on a request basis). There is no additional charge for your pet. Each pet at the Four Seasons hotel in Atlanta, Georgia is greeted in the room with biscuits baked by the executive pastry chef and the pet owner/paying customer recieves a newsletter detailing local pet-friendly places to visit. The hotel's pet menu is available 24 hours a day from room service and is so upscale it includes chopped steak for dogs, and filet of salmon for cats - and believe it or not: a one-ounce serving of Beluga caviar ($90) served with or without the onion, egg, parsley and sour cream garnish. In 2002, all 350 La Quinta Inns and Suites in 33 US states began accepting pets weighing less than 50 pounds. Motels chains are also accommodating the pet travel trend: about half of the Days Inn, Howard Johnson and Travelodge motels now accept pets. It's not just large hotels that have gotten pet friendly, smaller inns and bed-and-breakfasts are also offering pet friendly accommodation. The rural Glen Country Inn bed-and-breakfast in Fennville, Michigan extends an invitation to dogs to stay in its two-story farmhouse - and horses in its barn's horse stalls. World Travel Guide .com - Pet friendly hotels and lodging in Canada and the USA, pet friendly hotels and motels in Orlando Florida, pet travel accommodation for cats and dogs.